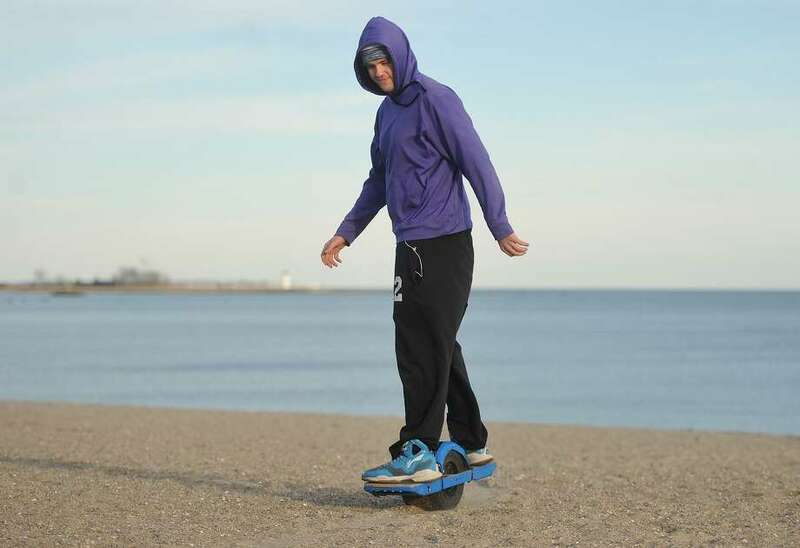 JC Obringer, of South Bend, Ind., rides his One Wheel, a motorized board, to Jennings Beach in Fairfield on Monday. At Gettysburg College, students use the opportunity to study globally to pursue diverse paths in multiple areas of study. Quinn Igram, an organization and management studies major from Fairfield, studied in Spain. Fellow Fairfielder Annie McNamara, a globalization studies major, studied in France. Miami University student Peter Mullen spent the fall semester in the Netherlands as part of a study abroad group. Mullen, from Fairfield, is majoring in business economics. Fairfield-based Home Builders and Remodelers Association of Fairfield County has been recognized with a Home Building Industry Award, “Best Promotion Event for a Spec Home” for its first home tour. The April 2017 event drew hundreds of visitors to four new luxury homes built by HBRA members in Darien and Greenwich and priced from $2.2 million to $6.7 million. The Home Tour Committee — made up of interior designers, architects, builders, and home staging experts — promoted the event, the participating builders and their homes, in transit posters, CTC&G Magazine, social media and more. Three out of the four homes sold within three weeks of the tour dates, and ticket proceeds, totaling $5,000, were presented to two charities: the Fairfield County Community Foundation and PSC Partners Seeking A Cure. The Fairfield County HBRA Home Tour is an opportunity for the public to view state-of-the-art luxury homes just coming to market. During the Saturday and Sunday event, the builders, as well as many suppliers and subcontractors for the homes, are on site to provide tours and answer questions. The 2nd Annual Exclusive Home Tour will be held June 23-24 with a special VIP night June 22. Fairfielders Abigail Burns, Emma Kagel, Gabriel Mansour, Benjamin Neugebauer, Samuel Perkins and Lauren Tarde made the dean’s list for the fall semester at Wake Forest University. The dean’s list is issued at the end of the fall and spring semesters for students who have a grade-point average of 3.4 or better for a full-time course load and who have earned no grade below C during the same semester. Fairfield native Megan Szuchman, an Ithaca College student, was named to the dean’s list for the fall semester. Kevin Hickey, of Fairfield, has been named to the fall chancellor’s list at the University of South Carolina Upstate. To be eligible for the chancellor’s list, students must earn a 4.0 and be enrolled in at least 12 course hours. Two Fairfielders made the academic dean’s list at Azusa Pacific University. These students are honored for a fall GPA of 3.5 or better. Richard Guinta is an exploring major and Philip Nesbitt is a cinematic arts production major. Four Fairfield natives earned dean’s list honors for the fall semester at Saint Joseph’s University: Kristen Babich, Alissa Capponi, Elizabeth Groenstein and Jane Hooper. Students must achieve a GPA of 3.5 or above, a B or greater in all their classes, and complete at least 15 credits to earn dean’s list status for a semester. Two Fairfielders were recently named to Colby’s dean’s list for outstanding academic achievement during the fall semester of the 2017-18 academic year, earning a semester GPA of 3.77 or higher. Estelle M. Baldwin, a member of the class of 2021, attended Fairfield Warde High School and is the daughter of James and Louise Baldwin, of Fairfield. Baldwin’s major is undeclared. Claire M. Mepyans, a member of the class of 2019, attended Fairfield Ludlowe High School and is the daughter of Priscilla Scanlon, of Fairfield, and Kevin Mepyans, of New York City. Mepyans’ major is chemistry-biochemistry. Merrimack College recognizes students who have achieved dean’s list for fall 2017, including Fairfield’s Michael Grace, Alexandra Scholl and John Gosselin. Dance shoes in closets around Fairfield County are being brought out for polishing as leaders of the local business community begin the demanding process necessary to compete in ElderHouse Adult Day Center’s annual Dancing with the Stars. The fifth annual gala benefit is being held March 24 from 6 to 11 p.m., at Rolling Hills Country Club in Wilton. The gala event showcases seven Fairfield County business representatives, each paired with an award-winning dance professional from Norwalk’s Fred Astaire Dance Studio, who donate their time to practice routines, hone them to perfection, and compete in this exciting and impressive dance competition. Dancing with the Stars Gala Benefit is ElderHouse’s largest annual fundraising event and helps the Norwalk nonprofit to sustain its award-winning program of adult care, socialization, and recreational activities to a senior population living with aging diseases. Funds will be raised through ticket sales, pledges, onsite voting, live auction, and a paddle raise. For more information on how to donate, make a pledge to a favorite dancer, or for event tickets, contact ElderHouse at 203-847-1998 or visit elderhouse.org/events. Do you drive on the Merritt Parkway late at night or early in the morning between Fairfield and Westport? Then be prepared for some delays because of a $56.7 million project that won’t be finished until August 2019. The project will focus on a five-mile stretch of the parkway between the Congress Street bridge in Fairfield to the Newtown Turnpike overpass in Westport. The project will include new pavement in both the northbound lanes and work on 11 structures related to the historic bridges, built nearly 80 years ago. There’s also upgrades planned for guiderails, drainage and restoration of the historic bridges. With all this work, lane closures are needed. Northbound lane closures are planned from 8 p.m. to 6 a.m. from Saturday to Wednesday and from 9 p.m. to 8 a.m. on Thursday and Friday. Southbound lane closures are from 7 p.m. to 6 a.m. Monday through Thursday; from 8 p.m. Friday to 8 a.m. Saturday and from 8 p.m. Saturday to 8 a.m. Sunday.